Are there any limits to the amount I may withdraw by cash or check? May I withdraw money in the form of a check (e.g. cashier’s check)? 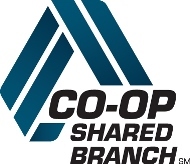 Do I have to be a U.S. person to deposit or make a withdrawal at a shared branch?